Houston Mayor Sylvester Turner is certainly cranky these days. How dare anyone question him giving his former partner a $7 million contract? Is the Sylvester Turner administration the most corrupt in the City of Houston’s history? You decide. We have a big thank you for Mayor Turner. When Dolcefino Consulting President Wayne Dolcefino was the investigative reporter at Channel 13, he just hated him. Now it seems Sly has moved on to a new journalistic target. He now hates the station’s current investigative reporter, Ted Oberg. We can’t imagine why he’s mad at Ted. At a City Hall news conference that is must-see TV, Turner accused Oberg of being some sort of biased political operative. Actually Mayor, Ted is only calling you out because your political deals stink. Mayor Turner wanted a Virginia company to get a $35 million Hurricane Harvey victim housing contract even though the company has been sued by the State of Louisiana for messing up the Hurricane Katrina cleanup. Louisiana politicians call them the “crème de crème” of awful. Can he be mad about that? Oh, we know why he’s sore. Channel 13 dared to question the familiar folks riding the political gravy train on hurricane relief, especially the lawyer the out of town folks are going to use. When the contract proposal was reviewed by a City Council committee, Barnes’ firm stood to make about $2 million. Suddenly, in the few weeks before City Council acted, somebody decided they needed a bunch more legal work than they had originally thought. The new sticker price? $7 million. Turner points out that his buddy Barry got contracts from government before he was Mayor. He’s absolutely right. Remember that Barry Barnes’ partner was then State Representative Sylvester Turner and their law firm got paid millions of your tax dollars. We are sure it was just qualifications and not buying political influence. The Mayor tells us he doesn’t tell contractors who to choose to help on city hall contracts, so maybe this Virginia based disaster relief company just got lucky. I bet they had no idea who Barry Barnes was – maybe they just liked his firm website. Have you noticed the Mayor gets really cranky when you question the way he’s spending our money? We are going to ask for all the records that explain how the Barry Barnes piece of the pie exploded in recent weeks. We will bet you Mayor Turner will fight it. He will try to hide the records. Use City of Houston lawyers to fight it in court. That’s what he does. Maybe now we know why he seems to hate firefighters so much. They dared to question. Mayor – don’t blame Ted. Look in the mirror. MEET THE CRANKY MAYORWe have a big thank you for Mayor Turner. When Dolcefino Consulting President Wayne Dolcefino was the investigative reporter at Channel 13, he just hated him. Now it seems Sly has moved on to a new journalistic target. He now hates the station’s current investigative reporter, Ted Oberg.At least he’s consistent.We can’t imagine why he’s mad at Ted. At a City Hall news conference that is must-see TV, Turner accused Oberg of being some sort of biased political operative. Actually Mayor, Ted is only calling you out because your political deals stink.Mayor Turner wanted a Virginia company to get a $35 million Hurricane Harvey victim housing contract even though the company has been sued by the State of Louisiana for messing up the Hurricane Katrina cleanup. Louisiana politicians call them the “crème de crème” of awful. Can he be mad about that?Oh, we know why he’s sore. Channel 13 dared to question the familiar folks riding the political gravy train on hurricane relief, especially the lawyer the out of town folks are going to use.It’s Barry Barnes, the Mayor’s former law partner – and get this: When the contract proposal was reviewed by a City Council committee, Barnes’ firm stood to make about $2 million. Suddenly, in the few weeks before City Council acted, somebody decided they needed a bunch more legal work than they had originally thought. The new sticker price? $7 million. Turner points out that his buddy Barry got contracts from government before he was Mayor. He’s absolutely right. Remember that Barry Barnes’ partner was then State Representative Sylvester Turner and their law firm got paid millions of your tax dollars. We are sure it was just qualifications and not buying political influence.The Mayor tells us he doesn’t tell contractors who to choose to help on city hall contracts, so maybe this Virginia based disaster relief company just got lucky. I bet they had no idea who Barry Barnes was – maybe they just liked his firm website.Have you noticed the Mayor gets really cranky when you question the way he’s spending our money?We are going to ask for all the records that explain how the Barry Barnes piece of the pie exploded in recent weeks. We will bet you Mayor Turner will fight it. He will try to hide the records. Use City of Houston lawyers to fight it in court. That’s what he does.Maybe now we know why he seems to hate firefighters so much. They dared to question.Mayor – don’t blame Ted. Look in the mirror. 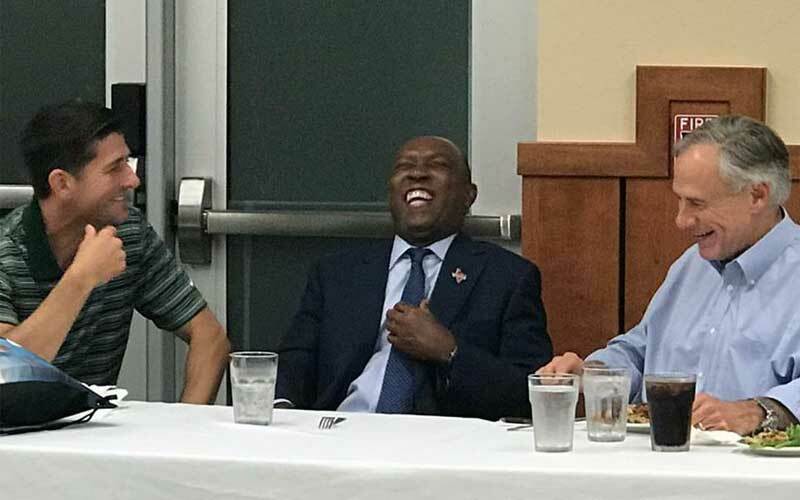 I admit that I had to laugh out loud (LOL) when Sylvester Turner said that Ted Oberg was biased. Of all of the reporters in Houston/Harris County, Oberg is the least biased. That guy doesn’t care who or what he investigates. Lordy I wish there were more reporters like that. It would come as news to a lot of current and former Republican elected officials if Oberg has some kind of bias against Democrats. When a wealthy career Democrat politician starts complaining about media bias, you know there’s something worth investigating there. Man in photo on left is not attorney Barry Barnes. Alan, I was told that was his son and thought it was interesting that his son would be working at the city. I did not confirm it, which is my mistake. I don’t know if it is his son or not, so I changed the picture. Is it his son? Thank you for clarifying via email that the Barry Barnes in the original picture is not related to Barry Barnes referenced in the post. How sad. My once vibrant Houston hometown is becoming the typical corrupt democrat run city. I am afraid the only chance for getting rid of Turner is term limits. Thank goodness for term limits. I wish the County government was providing the needed alternative leadership, but it’s not.